Above: A positive (left) and negative (right) image of supernova SN2013ga in Galaxy UGC 11895. Image courtesy of Doug Rich. Supernova SN2013ga was discovered by the Eagle Hill Supernova Search Project led by Doug Rich. Team members Doug Rich, Thomas Harvey, Michael Marion, Joe Rosebush, and Charlie Sawyer conducted the blink comparison that resulted in the discovery. Spectroscopic analysis of the supernova was conducted by a collaboration of astronomers from Dartmouth College, Texas Tech University, and the University of California at Santa Barbara using the FLOYDS robotic spectrograph and the 2 meter “Faulkes Telescope North” on Haleakala in Maui, Hawaii. Supernova SN2013ga was the 183rd supernova discovered in 2013. CBAT Director: Daniel W. E. Green; Hoffman Lab 209; Harvard University; 20 Oxford St.; Cambridge, MA 02138; U.S.A. e-mail: cbatiau@eps.harvard.edu (alternate cbat@iau.org) URL http://www.cbat.eps.harvard.edu/index.html Prepared using the Tamkin Foundation Computer Network SUPERNOVA 2013ga IN UGC 11895 = PSN J22042153+3944340 [Editor's note: this text replaces that on CBETs 3696 and 3703 (discovery date, Decl. ; additional observations)] D. Rich, T. Harvey, M. Marion, J. Rosebush, and C. Sawyer report their discovery of an apparent supernova (mag about 15.3) on unfiltered CCD frames (limiting mag 19.1) taken with a 0.41-m reflector on Oct. 19.150 and 20.980 UT in Hampden, ME, U.S.A, in the course of the Eagle Hill Supernova Search Project. The new object is located at R.A. = 22h04m21s.53, Decl. 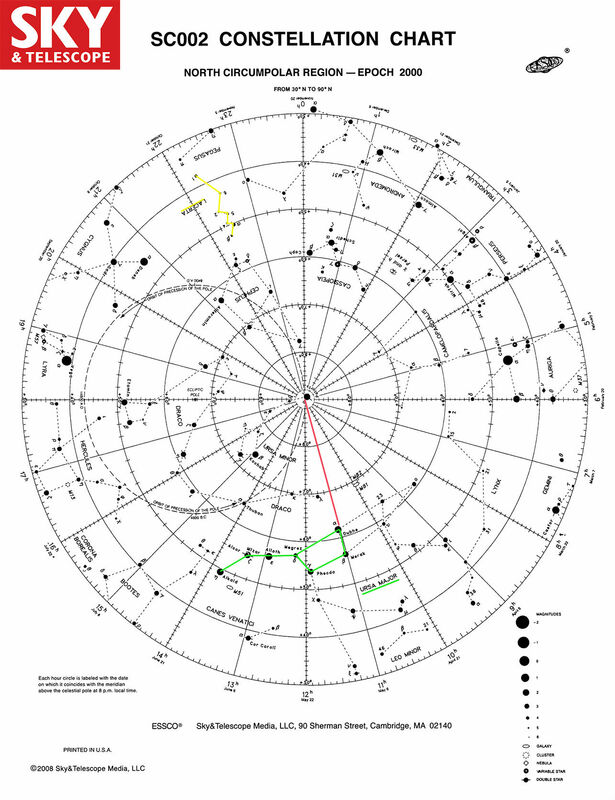 = +39o44’34″.0 (equinox 2000.0), which is about 10″.3 west and 3″.5 south of the center of UGC 11895. Nothing is visible at this position on a CCD frame taken by Rich on Sept. 19.110 (limiting mag about 19.0) or on Palomar Digital Sky Survey images from 1989 Sept. 4 (limiting red mag about 20.3) and 1992 Sept. 29 (limiting blue mag about 21.0). 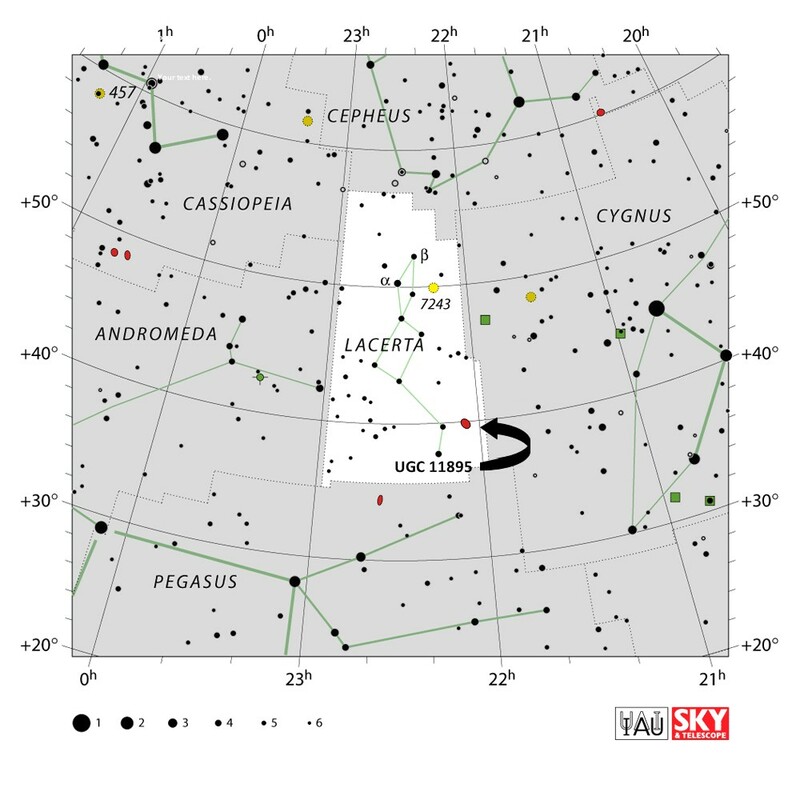 The variable was designated PSN J22042153+3944340 when it was posted at the Central Bureau’s TOCP webpage and is here designated SN 2013ga based on the spectroscopic confirmation reported below. Additional CCD magnitudes for 2013ga: Oct. 21.745, 15.8 (Gianluca Masi, Francesca Nocentini, and Patrick Schmeer; remotely using a 43-cm robotic telescope near Ceccano, Italy; position end figures 21s.51,34″.1); 22.170, V = 15.7, R = 15.9, B = 15.1, I = 16.3 (Joseph Brimacombe, Cairns, Australia; remotely using a a 51-cm RCOS telescope + STXL-6303 camera at the New Mexico Skies observatory near Mayhill, NM, USA; also unfiltered mag 16.1; position end figures 21s.55, 34″.5; image posted at website URL http://www.flickr.com/photos/43846774@N02/10439187785/ (Preview) ); 31.916, 15.7 (X.Bros, Ager, Spain; 35-cm reflector; position end figures 21s.63, 33″.0; UCAC2 reference stars; image posted at URL http://anysllum.com/PSN_UGC11895.jpg); Nov. 6.901, V = 16.1 (Massimiliano Martignoni, Magnago, Italy, 25-cm f/10 Schmidt-Cassegrain reflector; position end figures 21s.53, 33″.0). Masi et al. 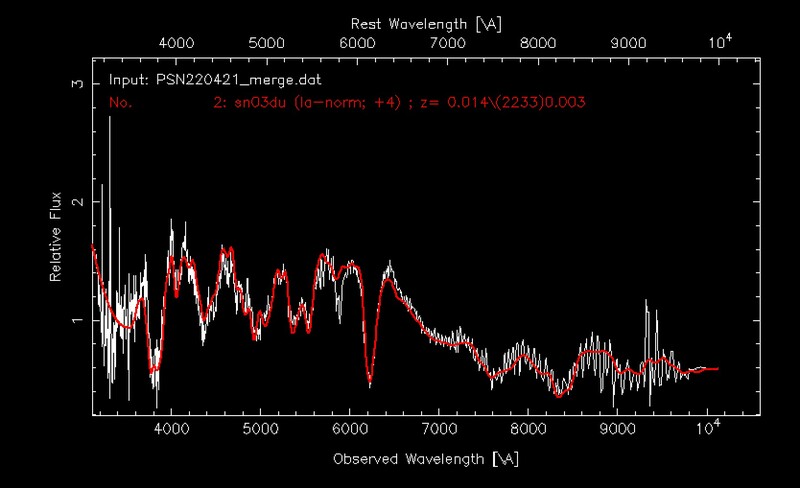 add that spectra obtained with a 0.36-m reflector on Oct. 21.85 (100 lines/mm grating; dispersion 3.47 nm/pixel) show very clearly an Si II absorption around 615.0 nm, suggesting that this is a type-Ia supernova. David Sand, Texas Tech University; Stefano Valenti, Iair Arcavi, and D.A. Howell, Las Cumbres Observatory Global Telescope (LCOGT) and University of California at Santa Barbara; J. T. Parrent, LCOGT and Dartmouth College; and D. Rich, Hampden, ME, U.S.A., report that a spectrogram of PSN J22042153+3944340 = SN 2013ga was obtained with FLOYDS (wavelength range 320-1000 nm) on the “Faulkes Telescope North” on Oct. 21.25 UT. The spectrum reveals 2013ga to be a type-Ia supernova at or before maximum light. The redshift of the supernova is consistent with that of the host galaxy, UGC 11895 (z = 0.0156, from Huchra et al. 1999, Ap.J. Suppl. 121, 287). Classification was performed via supernova-spectrum cross-correlation using the SNID software (Blondin and Tonry 2007, Ap.J. 666, 1024).